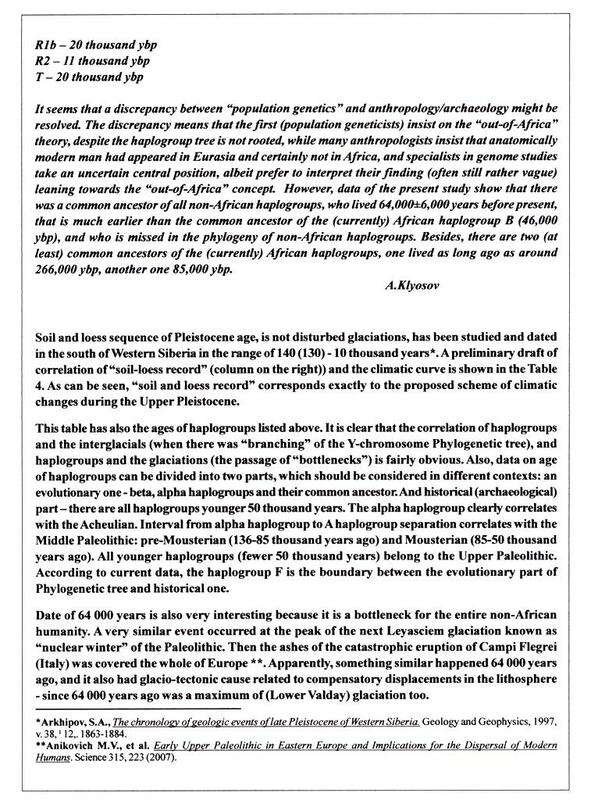 The Poster deals with the cosmic reasons for an alternation of Glaciations and Interglacials with a period of 26,000 years, and the reasons for the small 2000-year cycle, responsible for an alternation of Moisturizing and Aridization of Temperate zone. 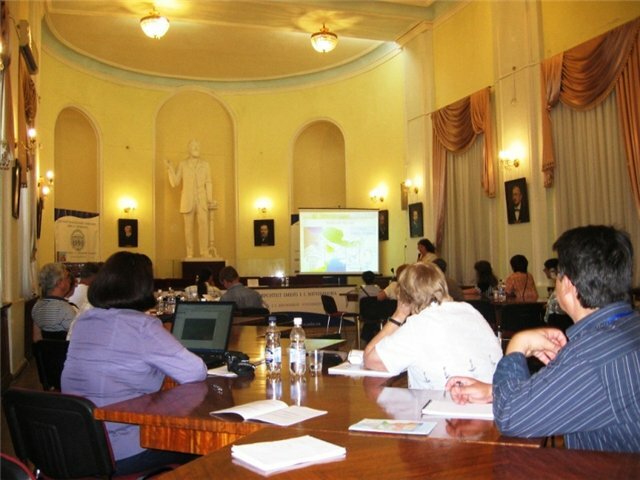 The Poster was presented at the INQUA 501 Meeting and Field Trip, Odessa, Ukraine, 21-28 August 2011. 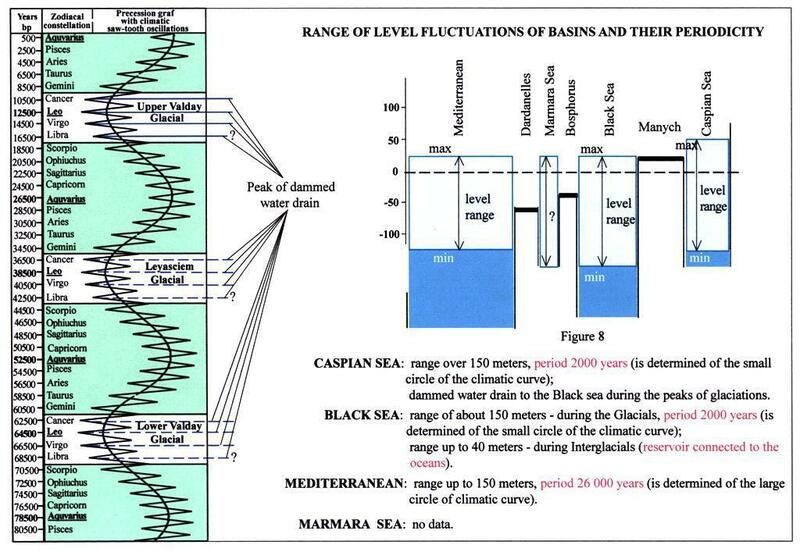 A scheme of climatic events and their correlations is proposed, which determines the complex hydrological system of the Caspian Sea - Sea of Azov - Black Sea - Mediterranean Sea in the Upper Pleistocene and Holocene. The scheme is provided in Table 1. 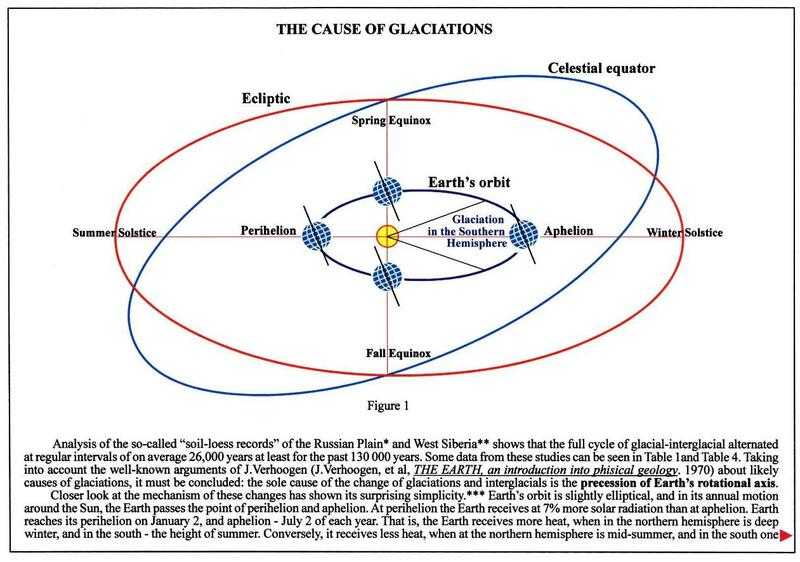 Its main idea is that climate on our planet is subject to periodic changes that are based on two factors: the precession of the Earth’s rotational axis, and the superposition of the orbits of the Earth, Moon, and Sun (Yurkovets, 2010). 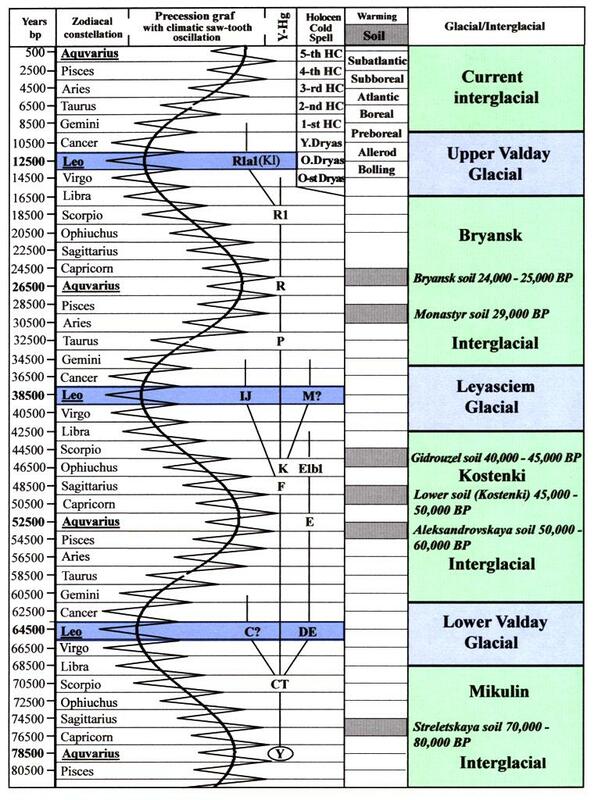 The first factor determines the alternation of glacials and interglacials, and it has a periodicity of approximately 26,000 years. In Table 1, it is presented in the form of a large sinusoidal curve. The second factor has a periodicity of 2000 years. It is presented in Table 1 in the form of a sawtooth curve. It determines the changes in cooling and warming stages during glacials and interglacials. 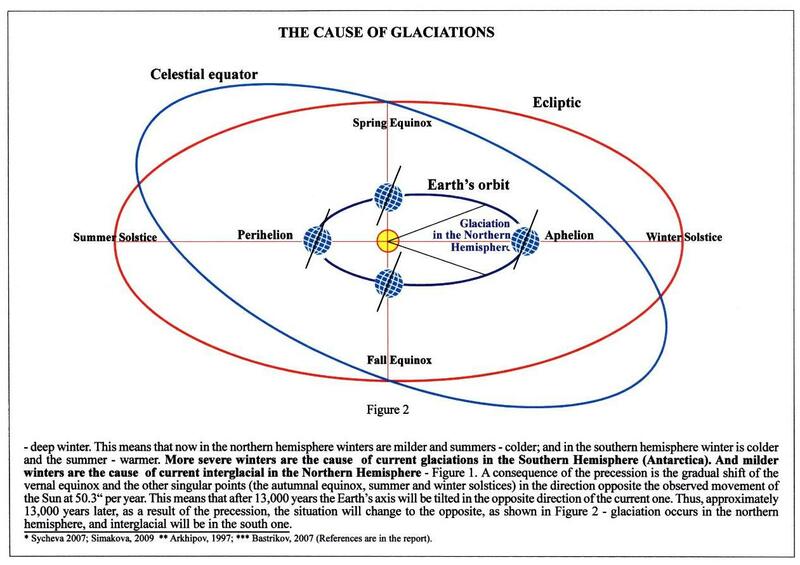 The first curve shows that the glacials take place in the hemisphere that is opposite the Sun at aphelion (due to the inclination of the Earth’s rotational axis). As a result, winters in the northern hemisphere are more severe, and that is the cause of glaciations. Over the full period of precession, glacials on Earth occurred twice: first in the northern hemisphere, next in the southern one. 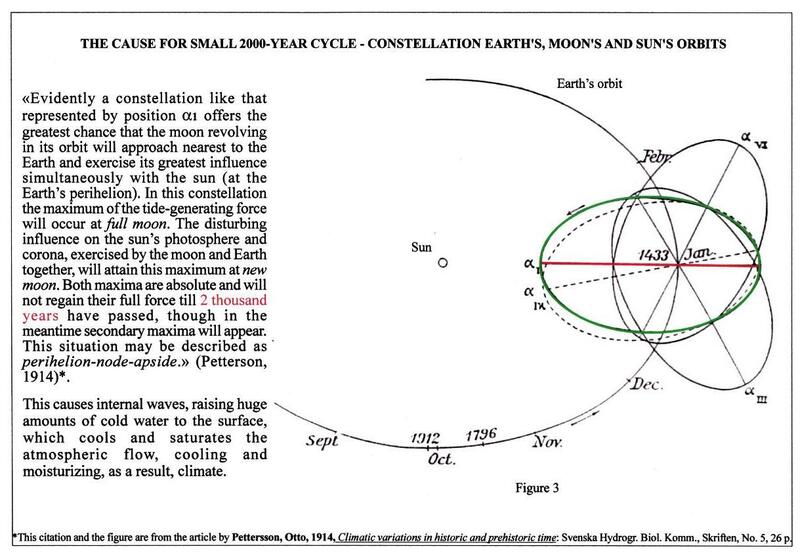 The mechanism of small cycles (superposition of the Earth’s, Moon’s, and Sun’s orbits) was discovered by Otto Pettersson at the beginning of the last century, and then confirmed by archaeoclimatic reconstructions of Shnitnikov, Matyushin, Shilik, and others (Yakushev, 2008). Large and small cycles determine changes in global sea level and that of inland water bodies, including the Caspian Sea. A very important point is that the oscillations in the oceans and inland water bodies occur in antiphase to each other, and this creates the complexity in the reconstruction of the hydrological regime of the Caspian Sea, Sea of ​​Azov, Black Sea, and Mediterranean Sea. In addition, the Manych Strait acts as a “valve” for the Khvalynian transgressions, and the Bosporus, for the oceanic ones. 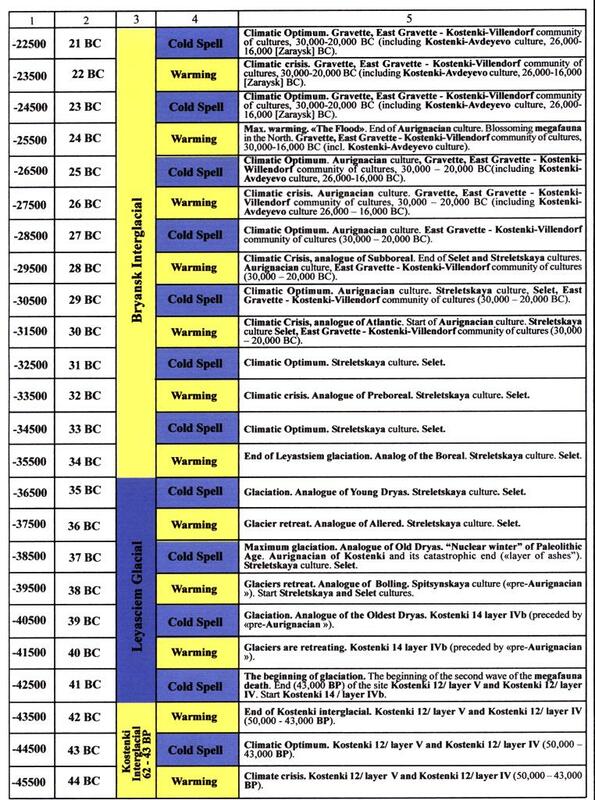 Comparing these cycles to the chronology of archaeological cultures from the Upper Paleolithic has been done, as described in Table 2 (Yurkovets, 2011a). 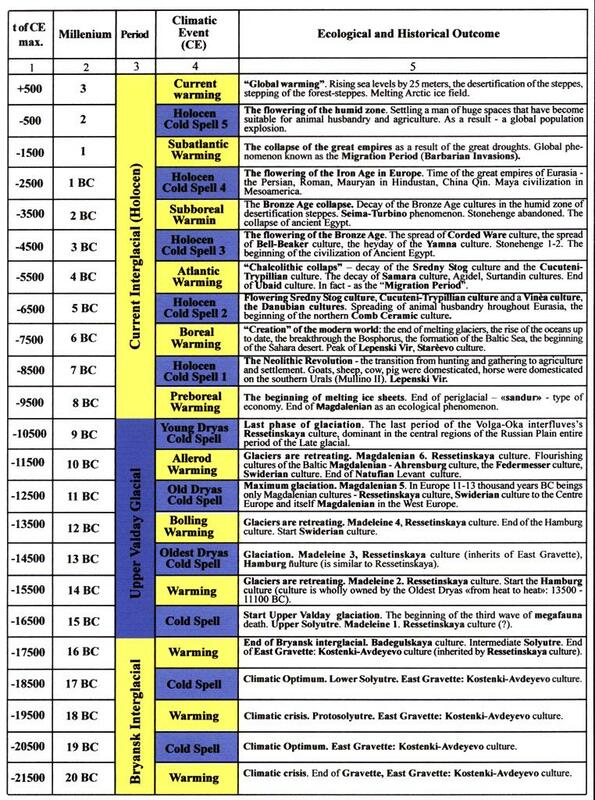 As can be seen, the archaeological events are determined indeed by the climatic cycles. 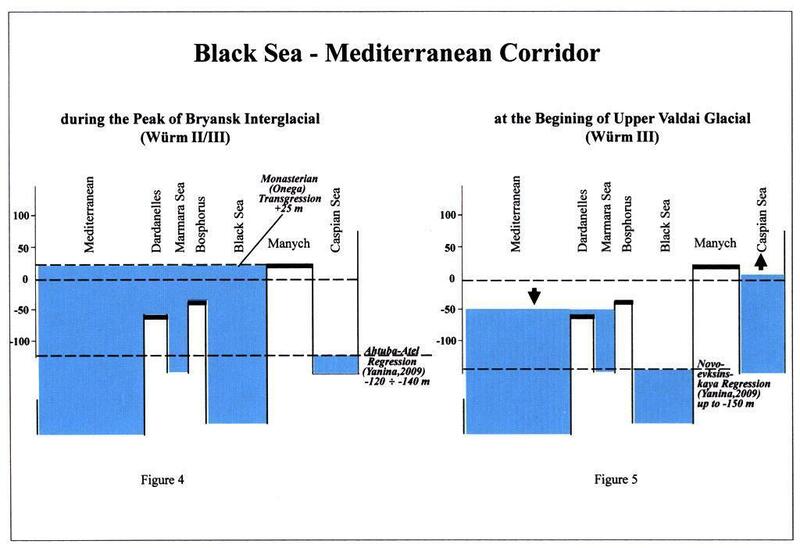 The proposed scheme fits well with a paleogeographic reconstruction of the Caspian and Black Seas by Yanina (Yanina, 2009), Antonova and Homenko (Antonova and Homenko, 2006), Badyukova (Badyukova, 2004, 2006, 2007), Gorlov (Gorlov et al., 2004), and others, see Table 3. 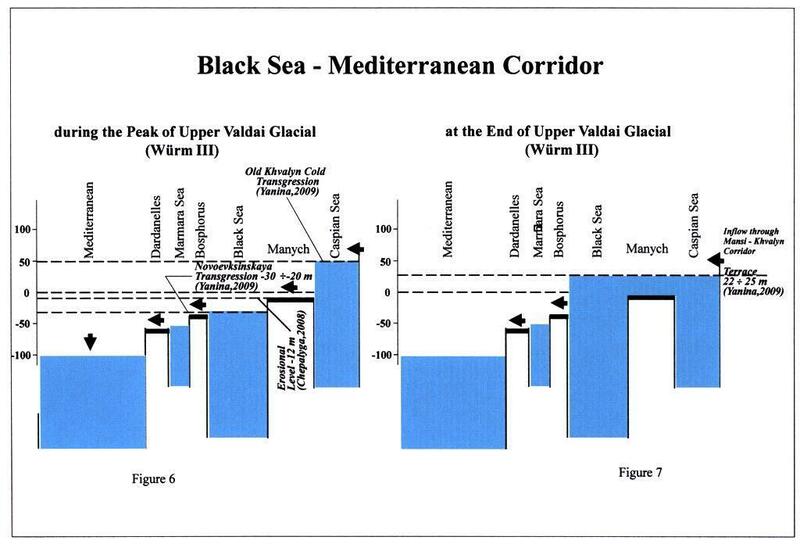 These considerations allowed us to refine both the time and the cause of the formation of the Manych Strait, through which the dammed waters of Eurasia discharged into the Black Sea during the glacials (Grosvald, 1989), as well as the Black Sea waters penetrating into the Caspian Sea during the warm Black Sea transgressions. The first stage was accompanied by erosion, which reached the –5 meter marker (Badyukova, 2006), and the second stage, as a small cycle, followed immediately after the first, when the Manych Strait was not blocked by silt, as shown in Table 1. This also explains the two observed levels of Khvalynian transgression, which were erosional and accumulative. The first occurred during the glacial maximum, when the base of erosion had lowered to level of the Pontic regression. The second occurred during the peak of warming, which followed immediately. Then the waters of the completed Khvalynian transgression met in the Black Sea the increasing Black Sea transgression. Their levels were equalized, gradually reducing the base of erosion to zero values. 6. Riss-Würm Interglacial — Mikulin Interglacial in Eastern Europe — Sangamonian Interglacial in North America. Inland water bodies, being less inertial systems, are most responsive to the alternation of small cycles (Patterson-Shnitnikov). 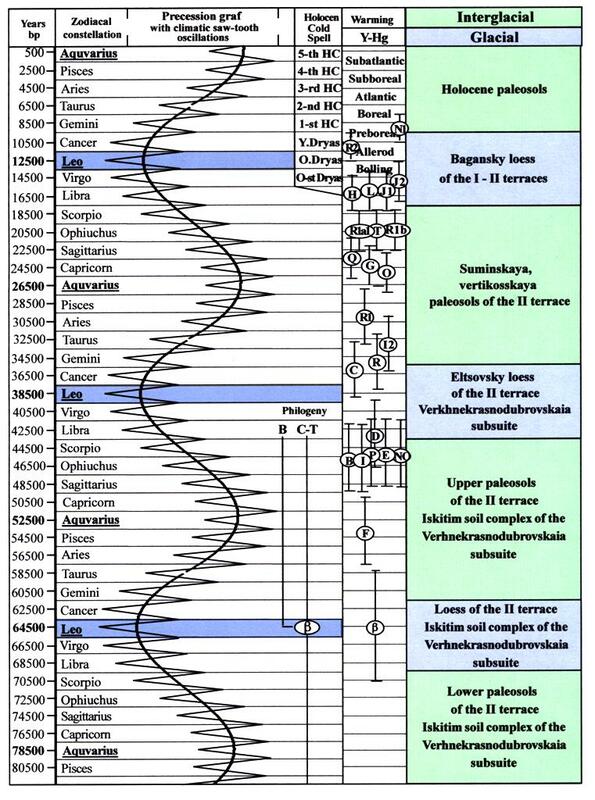 This shows up more here than in the oceans, the amplitude of the fluctuations in the Caspian Sea during the Holocene ranged from –60 to +50 meters (Matyushin, 1995). Sea level is primarily determined by the longer cycle, the cycle of precession, however, the main contribution is only half responsible for the glaciers in the northern hemisphere. This is explained by the unequal distribution of land on the planet. The southern hemisphere is now at the height of glaciation, but the glaciers have no place to develop, with the exception of a relatively small area of Antarctica. But a “gravitational surplus” of ice is constantly “flowing” into the ocean as icebergs, thereby maintaining its level. 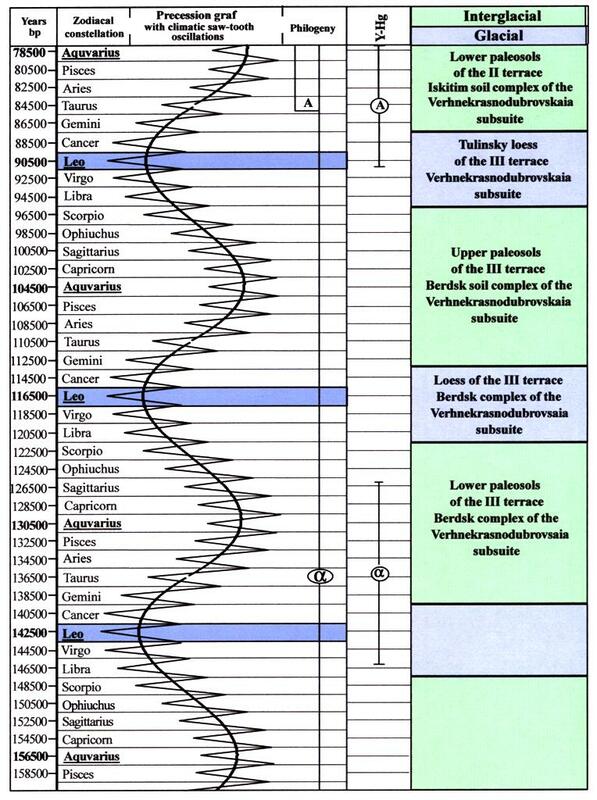 The amplitude of sea-level oscillations in the Upper Pleistocene, due to the longer cycle, exceeds 200 meters (Grosvald, 1989). While the oscillations due to the short cycle, show relatively small fluctuations within a few meters (Fedorov, 1982). In addition, the correlation of Mediterranean, Black Sea, and Caspian Sea terraces should consider the existence of the Manych and Bosporus “valves,” converting the Black Sea into either the inland body of water or the oceanic one. 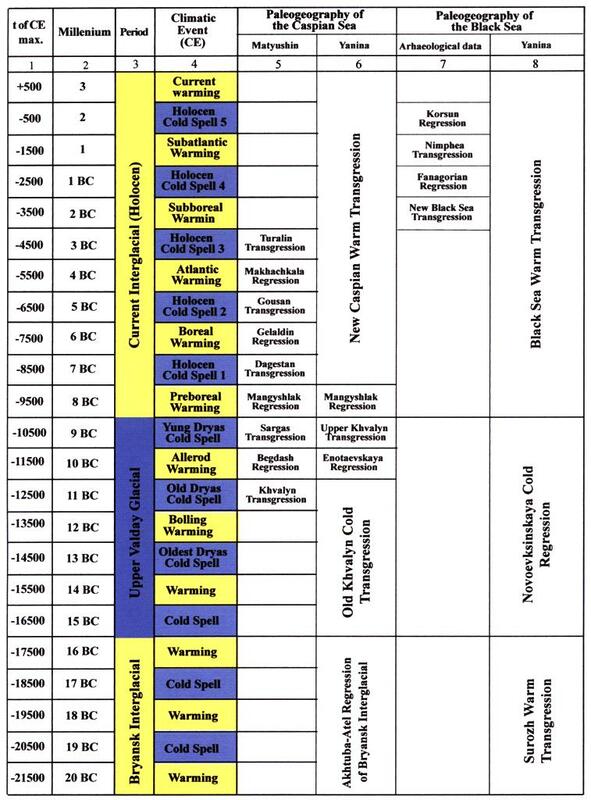 Therefore, Table 3 should not be regarded as the final correlation of terraces of the Caspian and Black Seas, but as the matrix, which must be filled with actual material. DNA genealogical aspects. 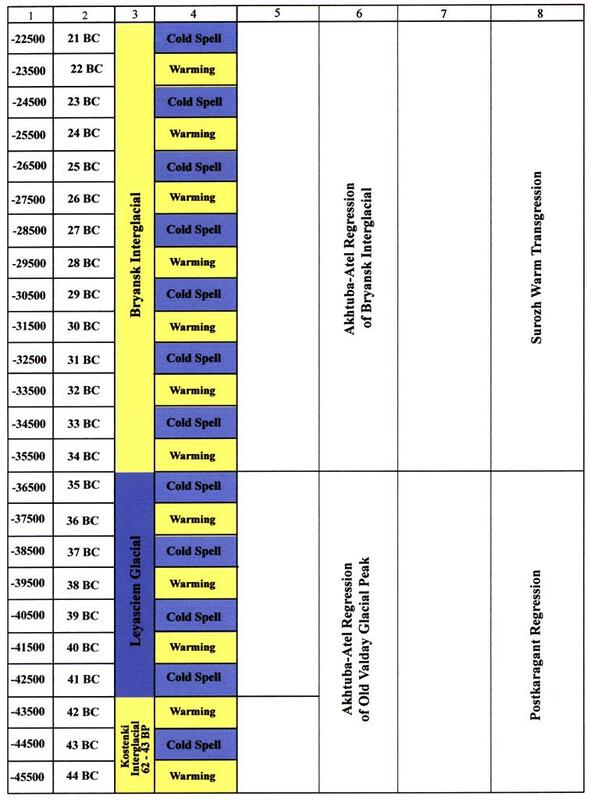 The climatic history of the Upper Pleistocene and Holocene was recorded not only in the Quaternary geological chronicle and the material of archaeological cultures, as shown in Tables 1-3, but also indirectly, through the history of haplogroups, in the structure of the DNA. 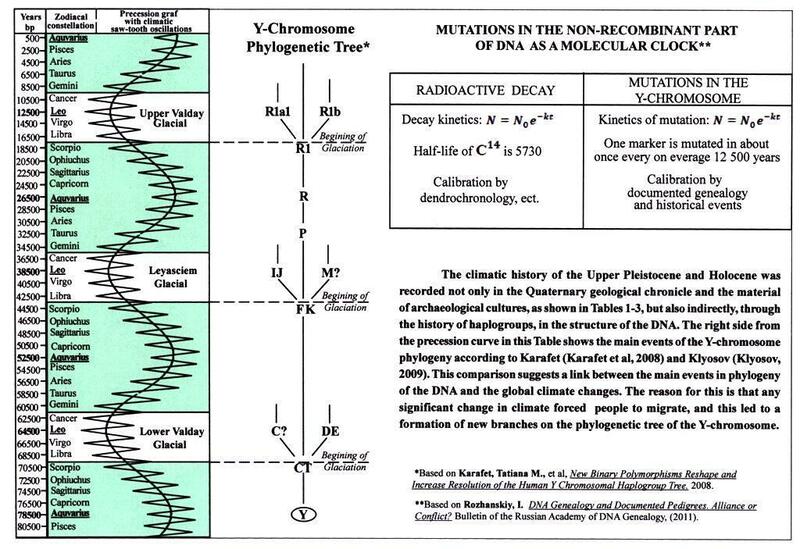 Along the right side of the precession curve in Table 1 are listed the main events of Y-chromosome phylogeny according to Karafet (Karafet et al., 2008) and Klyosov (Кlyosov, 2009). 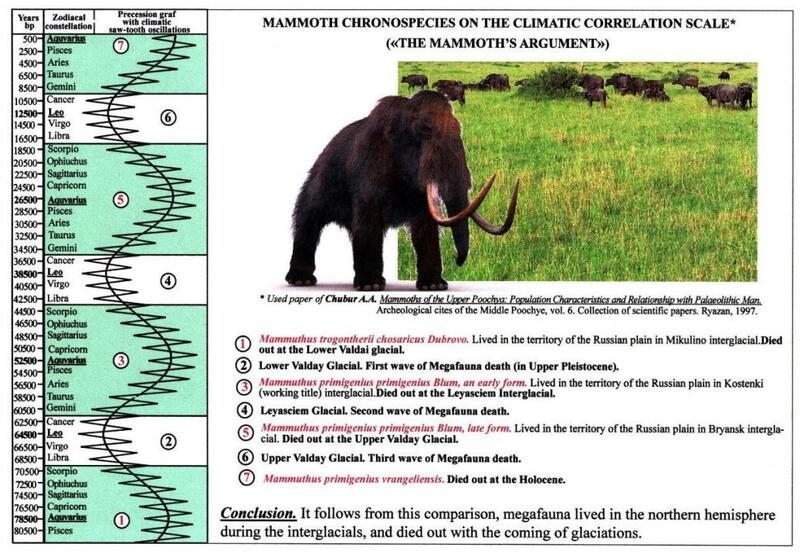 This comparison suggests a link between the main events in phylogeny of the DNA and global climate changes. The reason for this is that any significant change in climate forced people to migrate, and this led to the formation of new branches on the phylogenetic tree of the Y-chromosome. Those coordinated phylogenetic and climatic events sometimes can be distinctive. Thus, the warming Subatlantic led not only to the collapse of the great empires of the Iron Age in Eurasia (the "Great Migration of Peoples"), but it resulted in a "population bottleneck" for people in the eastern part of the continent. As it turned out (Rozhanskii, 2011), at least 70% of the Mongols and Kirghiz, as well as a large percentage of the Kazakhs, happen to be direct descendants along the male lines, possibly originating from only five individuals (common ancestors) who lived there at those times. This is remarkably correlated with the historical events that led to the unification of China, and then to the emergence of the empire of Genghis Khan (Yurkovets, 2011b). Karafet, T.M., Mendez, F.L., Meilerman, M.B., Underhill, P.A., Zegura, S.L., and Hammer, M.F. 2008. 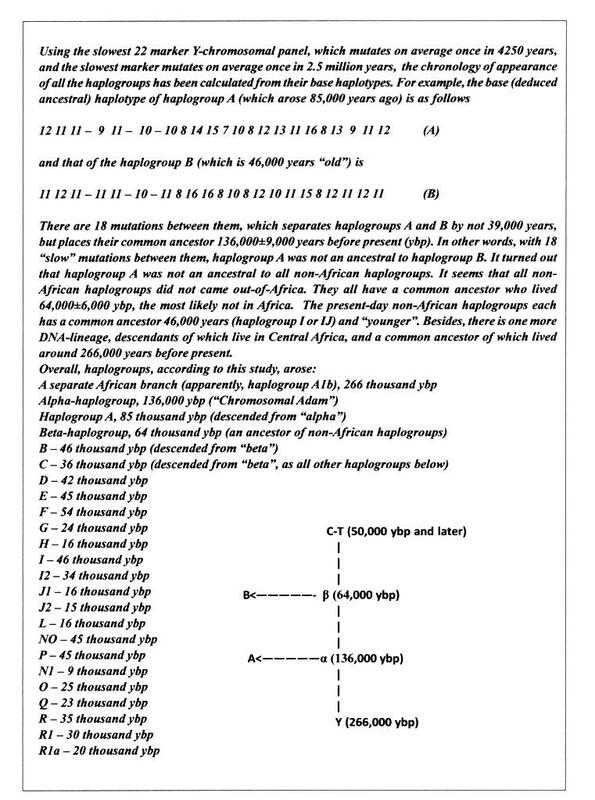 New binary polymorphisms reshape and increase resolution of the human Y chromosomal haplogroup tree. Genome Research 18:830–838.